SHRUG OFF THE BUGS that make you miserable... And ease digestive discomfort, too! You already know that a strong immune system helps defend you against colds, pathogens, viruses and other “bugs” that can get you down. But did you also know that 80% of your immune cells thrive in your intestinal tract? It’s true! The digestive system plays an essential role in the healthy function of your immune system. In fact, the tens of trillions of beneficial bacteria in your gut are an important part of keeping every part of your body healthy and functioning. That’s why if you want to power up your natural defenses against illness, you must support and protect your digestive tract. And that’s exactly what GutProtect™ is designed to do! 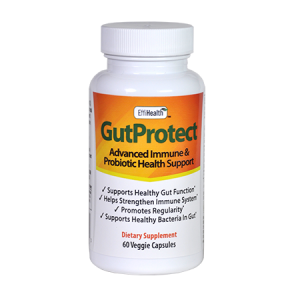 GutProtect™ starts with two ingredients that are shown in human studies to deliver effective support for immune and stomach health. Advanced Ingredient #1. 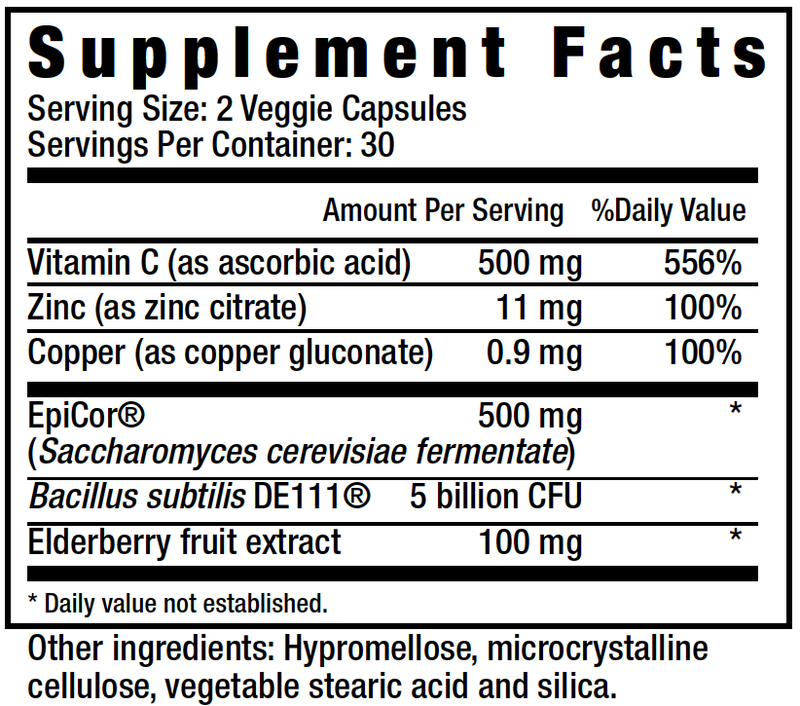 EpiCor®: a multivitamin for your immune system. EpiCor® is a unique and natural whole-food yeast that’s packed with polyphenols, metabolites and other compounds. Multiple clinical studies show that it is one of the most effective ingredients on the market to help strengthen your immune system. GutProtect™ contains 500 mg of EpiCor® per daily dose — the same amount used in the clinical studies. Unlike typical probiotic bacteria DE111® isn’t harmed by high temperatures or stomach acids. Instead it stays “alive” throughout the stomach and GI tract, so it can colonize in the intestine where it can do the most good. DE111® is also very stable and does not require refrigeration like other probiotics do. In stability testing, it experienced virtually no loss of potency over 2 years. GutProtect includes B. subtilis DE111® at 5 billion CFU’s, which was the clinically studied dose. When you give your digestive system what it needs, every part of your body feels the benefits — especially your immune health. With its unique formulation of EpiCor®, DE111®, Elderberry and additional nutrients, GutProtect is the most potent natural immune-booster available today. Are you needlessly putting up with illness and fatigue? Pick up a probiotic supplement and you’ll see that it probably contains a blend of non-spore bacteria like lactobacillus and bifidobacteria. And while these strains deliver health benefits, they aren’t very stable. They usually can’t survive the acidic environment of the GI tract. They also need refrigeration and will not survive for long in room temperature environments. Spore-forming bacteria are the only probiotic strains that don't need refrigeration and that withstand stomach acid. They remain stable and potent on shelves for months. DE111® is a unique probiotic spore that’s clinically tested and proven effective to support healthy gut flora as well as the normal proliferation of beneficial bacteria. March 4, 2019 | by John R.
December 2, 2018 | By Mary M.
November 23, 2018 | By Christopher J. 80% of your immune cells are in your intestinal tract. Therefore, if you keep your intestinal tract healthy, your immune system becomes stronger. 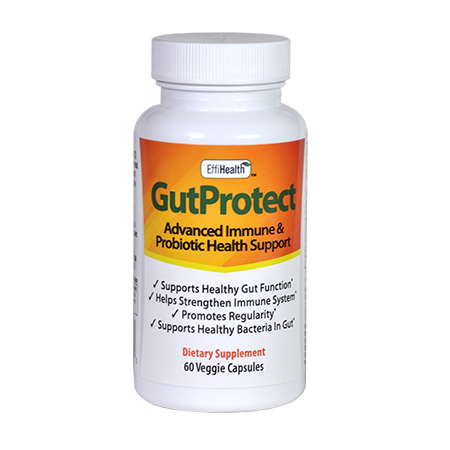 GutProtect™ contains two patented, clinically tested ingredients that are proven in human studies to support gut health and strengthen your immune system. I already take a probiotic. Why do I need GutProtect™? EpiCor® Whole food fermentate is a natural ingredient comprised of proteins, fibers, polyphenols, vitamins, amino acids, beta glucans and many beneficial metabolites that work together on many levels to support a strong immune system. EpiCor and has many published research studies on its safety and efficacy. What is Bacillus Subtilis DE111? B. Subtilis DE111 is a probiotic spore that bolsters immune function and digestive stability. It helps increase levels of beneficial bacteria in the gut and crowd out harmful pathogens. It also has a unique ability to form spores that protect the microbes from harsh conditions through to the destination where they can germinate robustly – the GI tract. Although there has never been an issue with taking GutProtect™ with any medication, we recommend that you ALWAYS seek the advice of a physician or other qualified healthcare provider with any questions you many have regarding a medical condition(s) before taking this or any other product.